I had my genes analyzed for ‘precision wellness.’ Here’s how it went. It takes surprisingly long to fill a plastic tube with spit. Finally, I’m ready to put the lid on the tube and slide it into an envelope that comes with the test kit. It’s my first personal DNA test, and I’m doing it with Singapore startup Imagene Labs. Once the startup has analyzed my genetic code – it takes two to three weeks – I will receive personalized wellness recommendations: What foods to avoid, what products are good for my skin, and how I should exercise. “Precision wellness” is how Imagene Labs director Jia Yi Har describes her work. Personal DNA tests became popular in the US with companies like 23andMe and Ancestry.com, who tell you about your genetic heritage. The results are mostly fun discoveries – perhaps you have an unexpected strand of Native American ancestry in your family tree. Imagene Labs takes it further. 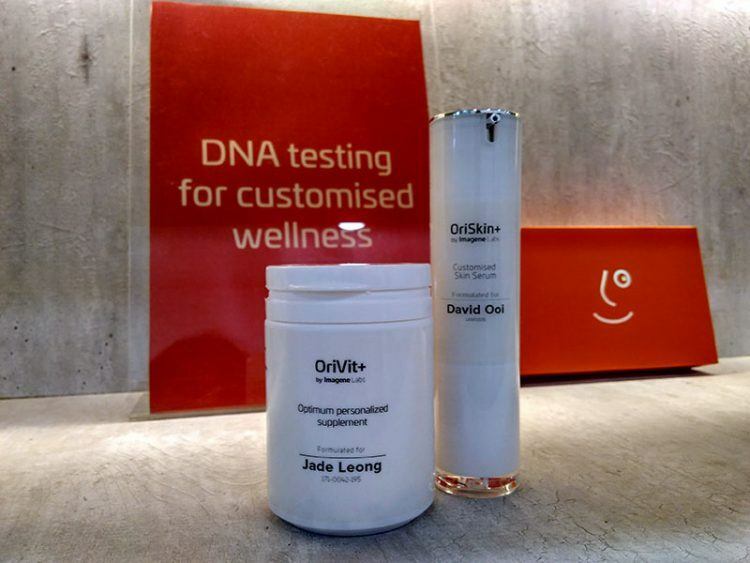 Its main product, Ori, is a DNA testing platform and subscription business in one. Once Ori knows the genetic properties of your skin, digestive tract, and muscle tissue, it concocts tailor-made products that you can have shipped to your home. The skin serum comes in a slender white bottle with your name on it. This stuff is made to perfectly balance your skin type. Then there’s a food supplement, a mixture of granules in different shades of green. It contains nutrients and vitamins which your body tends to lack due to genetic predispositions, all in the right percentage. “The exercise you have to do yourself,” says Reza Harith, who joined Imagene’s team after working as a brand manager at a fitness studio chain. The Ori results come with exercise recommendations, put together by fitness experts based on what your DNA says about your muscle growth capacity, metabolism, and other factors. Ori’s products: A skin care serum and food supplement. Creating DNA-based products and services became possible because the cost of DNA sequencing has gone down, Har explains. Another key innovation startups like Imagene Labs rely on is Illumina. The process allows researchers to isolate specific locations in the genetic code. These are called SNPS – pronounced snips. “We know which particular locations are proven to contribute to the traits we are interested in,” Har says. Imagene includes only those snips in its analysis that have “thousands of published scientific studies” backing up their correlation with certain traits. To make that more concrete: One of the genes tested in Ori’s fitness analysis is called IGF2. It’s proven to be associated with muscle soreness. My particular variation of this gene puts me into “90th percentile” of the average population – in other words, I have a higher than average likelihood of feeling sore after exercise. With Illumina, Imagene can focus on pre-selected snips. 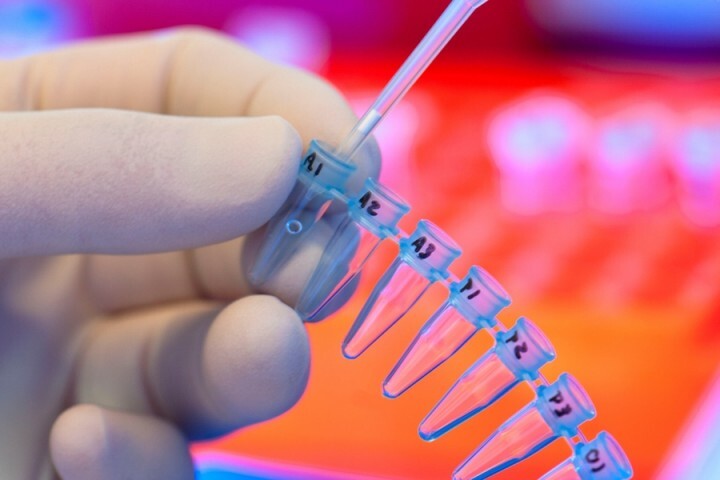 This doesn’t only make it faster, it also helps avoid ethical and legal complications – if a startup had your full genome, it could potentially also know about critical diseases. Using DNA for medical diagnostics is its own discipline with a slew of regulations, explains Har. Imagene’s parent company, Asia Genomics, is in this business. It runs medical diagnostics like prenatal tests, which look for abnormalities in babies before they are born. They are distributed through clinics and administered by professionals. Everything needs to be certified. Focusing on wellness means Imagene Labs isn’t bound by the same requirements. Its association with Asia Genomics gives it a huge leg up because it can share the parent firm’s professional lab facilities and team resources. 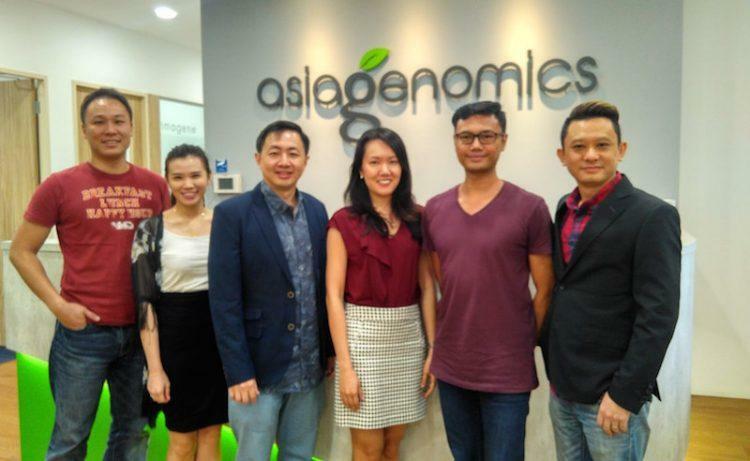 Asia Genomics has so far raised US$12 million from investors like Formation 8, Raffles Venture Partners, Spring Seeds, and some angel investors, Har says. Asia Genomics started in 2014, and Imagine Labs spun out in 2016 as an attempt to spark consumer interest in DNA-based personalization. Ori was first available in Singapore, then in Malaysia, Thailand, Hong Kong, and Jakarta. There’s also a second full lab in Beijing. Imagene Labs team. Tech in Asia spoke with director Jia Yi Har (3rd from right) and marketing manager Reza Harith (2nd from right). Asia is a good place to start with these products because people are generally willing to experiment when it comes to wellness and beauty, Harith says. He is establishing relationships with spas and fitness centers as distribution channels for Ori. “Intravenous vitamin drips, chemical peels, and fillers – in Thailand and Malaysia, it’s common to try these,” he says. While Singaporeans tend to be more skeptical about new trends, they do often get on board later once fringe trends trickle into the country from its neighbors. Even though DNA sequencing prices have gone down, Ori is still an investment many will think about twice. Just one of the tests, the skin test, costs US$184. This comes with a 30-day supply of your personalized facial serum. After it’s done, you can get a new bottle for US$89. The number of tests run since Ori’s launch in 2016 is “in the thousands,” Har says. There’s not been a clinical trial on the effectiveness of recommendations and products provided, but client feedback, she adds, has been encouraging. Imagene Labs is at the cutting edge of the DNA personalization trend. Only a few other startups, mostly US-based, are exploring the opportunities. There’s Habit, which combines DNA analysis with a subscription-based food delivery program, and DNAFit, which is similar to Imagene Labs’ Fitness component. Science is not yet convinced that DNA-based fitness and wellness has massive benefits over regular practices. An article by Vox quotes John Mathers, the director of the Human Nutrition Research Center at Newcastle University, on his interpretation of Habit’s product. His group had done research comparing different types of personalized dietary advice to a control group. Those that received personalized advice did perform better, but “there was no evidence that including phenotypic and phenotypic plus genotypic information enhanced the effectiveness of the [personalized nutrition] advice,” Mathers said. In other words, DNA-based personalization was not doing significantly better than other forms of personalized advice. But with falling costs and fast-developing tech, Har believes it’s only a matter of time until there are products that make the jump from the fringe to the mainstream. Consumers in Asia spend massive amounts on beauty products. Ori’s skin serum is so far its best-selling product. The Asia-Pacific beauty and healthcare market amounted to US$98.5 billion in 2015 and will grow to around US$127 billion by 2020, according to Statista. Globally, Asia Pacific makes up the largest share of the market. The cosmetics industry is in constant need to innovate, Har says. This has led to an immense variety of ingredients, design, and marketing messages. And according to Har, beauty brands have been watching Imagene Lab’s work with great interest. As for my Ori test results, I found many interesting recommendations that often matched what I already knew about myself. The most helpful advice, perhaps, was in the nutrition analysis, which found a high genetic predisposition for COQ10 deficiency – a coenzyme that provides energy to cells for growth and maintenance. Instead of buying Ori’s own supplement mix, I chose to get my own and follow the dietary recommendations. Which in my case, means adding plenty of liver and kidney to my diet. Yum.